In 2017 in Grupo Azor we are celebrating our 60 anniversary all of them dedicated to manufacture and commercialize writing, office and scholar supplies, offering more tan 3,000 products in the stationery market. 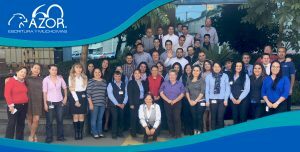 We are proud of being a 100% mexican company, which started with a small workshop with 10 employees, today we are a solid and strong company with more than 300 compaign workers, with presence in Mexico and some Latinamerican countries. We appreciate your preference and we know we have new challenges to come, this is why we confirm our compromise to keep working with energy and positive attitude to achive the challenges objectives, working on being a high productive company.